Jamie asks: Why is New Year’s day January 1st? Because Julius Caesar said so. Since long before Caesar’s time, date keeping was dicey. In fact, the 355-day Roman calendar that immediately preceded Caesar’s Julian, worked on a four year cycle where every other year, an additional month was inserted between February (Februarius), the last month of that calendar year, and March (Martius), the first month of the year; this was done in order to catch the calendar up with the Earth’s orbit of the Sun. That additional month, called the Mensis intercalaris, brought in the missing 22 or 23 days, and to even things up, took another five days from February in the years it was present. Misused their power by intercalating days or not intercalating them, merely in order to lengthen or shorten some magistrate’s year of office, or to increase the gains of some government contractor, or to inflict loss upon him. By the time Caesar came around, the Roman calendar was in shambles, and in 46 BC, Julius Caesar commanded that it be changed. In order to wipe out the consequences of past neglect, it was necessary that the year 46 BC (called by Macrobius the annus confusionis) should extend to 445 days. The normal number of 355 days had already been increased by the addition of the ordinary 23 days, inserted after Feb. 23. As many as 67 days, divided into two menses intercalares . . . were now interposed between November and December. . . . This year thus consisted of 15 months. After this “year of confusion,” the new calendar really started. Intercalation was abolished, and each year was increased to 365 days, with a leap year added every fourth year (quarto quoque anno) to February. The months of the calendar after Caesar’s shake-up followed the old Roman calendar closely and most are familiar to us even today: Ianuarius, Februarius, Martius, Aprilis, Maius, Iunius, Guintilis, Sextilis, September, October, November and December. Along with these changes, Caesar set the New Year to January 1. Why? Since 153 BC, January 1 was the day new consuls in Rome took office and Romans had commonly used the name of the two consuls to identify a specific year in question. Thus, by officially making January 1 start the New Year, it simply lined up with the consular year. As to why the consular year started on January 1 instead of the original Roman Calendar New Year’s day of March 1, this isn’t known. That said, there are references that seem to imply that January 1 may have begun marking the New Year as early as 189 BC, which precedes when the consular year started beginning on that day. One proposed reason for this switch is that January is thought by most to have been named after the god of transitions and beginnings, Janus, during the reign of the second King of Rome, Numa Pompilius, who lived from 753-673 BC. Thus, it was naturally enough for the Romans to eventually decide to make the switch. However, whether this is the reason or not is very much up for debate. Although the Julian Calendar was relatively accurate, its use of 365.25 days in a calendar year, as opposed to the precise 365.2425 days, over centuries, created a discrepancy in the calendar. In fact, by the time Pope Gregory XIII (1572-1585) became the Bishop of Rome, the Julian calendar had lost 10 days. It was this discrepancy that brought about the reformed calendar. Actually beginning 20 years before the calendar took effect with the Council of Trent in 1563, church leaders wanted to restore the spring equinox to the date it was when the First Council of Nicaea was convened in 325 (by 1563, the equinox was falling on March 11, rather than March 21). As simple as making a Papal decree, Gregory issued the Inter gravissimas on February 24, 1582, and nearly eight months later, the last day of the Julian calendar, October 4, 1582, was followed by the first day of the Gregorian calendar, October 15, 1582. Voila! Today, the Gregorian calendar is the unofficial calendar of the United States and the United Nations, as well as most countries in the world. After he was murdered by a small group of his “friends” (“Et tu, Brute?”), the Roman Senate made Caesar a god on January 1, 42 BC, a date which coincided with the time-honored practice of making offerings to Janus in the hope of having good fortune throughout the year. Throughout the Middle Ages in Europe, January 1st’s New Year’s celebrations were discouraged, as they were seen by church leaders as a pagan practice. Instead, other days were often used as a substitute varying from nation to nation. This changed when the Gregorian calendar was instituted and, at least in the Catholic nations, January 1 once again became the official New Year, and it slowly spread from there with the Gregorian calendar. As mentioned, many protestant nations ignored the Gregorian calendar for some time. England stuck to the Julian Calendar until 1751 before finally making the switch. Orthodox countries took even longer to accept the change in calendars. Russia, for one did not convert to the Gregorian calendar until after the Russian Revolution in 1917. The funny thing was, in 1908, the Russian Olympic team arrived 12 days late to the London Olympics because of it. Every year that is exactly divisible by four is a leap year, except for years that are exactly divisible by 100, but these centurial years are leap years if they are exactly divisible by 400. For example, the years 1700, 1800 and 1900 are not leap years, but the year 2000 is. of the Gregorian calendar, October 15, 1582. Viola! @Vlad: Yep, thanks for catching that. 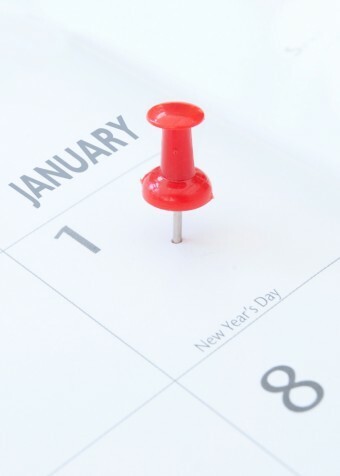 January 1 once again became the official New Year, and it slowly spread from their with the Gregorian calendar. Should that read “it slowly spread from there”? One would expect the New Year to begin at one of the solstices or equinoxes themselves, since those events have a special astronomical and religious meanings. Did you do some research into that aspect? I’ve heard that Consuls started taking office on January 1st because taking office on the first of the year (March 1) did not give them time to get ready for the ‘war season” that started every spring.